You can now create custom badges to make your logo and employees shine! Our die-cut capabilities allow you to customize your badge with your favorite icon or brand and have your designs cut to shape. You can order these in as little as a quantity of 1, while leaving your clothing in perfect condition because of our magnetic attachments. Make name badges by uploading their logo and employee names. Or showcase your logo for your brand at tradeshows, panel discussions and other networking events. Our badges are made out of 60 thou Styrene, and similar to acrylic badges, are incredibly durable for all purposes. Our inks are scratch-resistant, meaning you can show off these badges for long periods of time without any wear and tear. Having a magnetic attachment is a terrific alternative to pinned badges, as you can express your brand, your ideas, your designs without leaving a hole in your clothing. The magnetic strength holds even if you're wearing your bulkiest sweater, or your thickest wool coat. Choosing our die-cut badges is also beneficial when compared to badges with lanyards, as it reduces the amount of accessories you need to purchase along with the badge, and the magnetic back makes it extremely easy to put on, and take off. For more information and video of the magnetic badge backing, check out our blog! Not only can you customize your badge with your favorite icon or brand, you can further personalize it by adding on your name! In some businesses and events, name tags are crucial. Make your brand, design, and name stand out with our custom writable badges. You can choose to have your name printed on or even write it on yourself with permanent marker. You’re unique and so is your handwriting, so why not personalize your custom badge by writing on your own name or personal message? Embrace one of the many things that makes you one-of-a-kind and make what matters stick with StickerYou’s custom writable badges! Don't worry about lamination! Just like the acrylic pins you see elsewhere, our Styrene badges are waterproof, so you don't have to think twice about wearing your branded badge for outdoor events like concerts, farmer's markets, outdoor patios and more! Not looking for badges that serve a business purpose? Our custom die-cut badges can be ordered in quantities as little as one! If you have a favorite logo, photo, or statement that you want a custom lapel pin for, our badges are a great alternative. With faster turnaround times compared to enamel badges or enamel pins, your designs will show up to your doorstep in no time, and with the advantage of full-color print! Use these as jacket badges, or even on your favorite bag or accessory to personalize your wardrobe and make your personality shine! Need more than 250 badges? Fill out this Custom Quote Form, and one of our sales representatives will be in contact with you to help you place an order. Q: How many badges can I order? A: At StickerYou, you can order custom name badges in quantities as little as 1 or as many as your heart desires! Simply click on the Make Badges Now button above, then upload your own artwork or browse through thousands of designs in our Art Gallery. For orders with more than 250 badges, just fill out this form and one of our sales representatives will be in contact to help you place your order. Q: Where can my custom badges be applied? A: Since our custom badges use a magnetic attachment instead of a pin, you can show off your brand or personal expression without the fear of ruining your clothes. Whether you choose to wear your bulkiest sweater or thickest wool coat, you can be sure that your badge will stay on strong due to its powerful magnets! You can also use our custom magnetic badges as jacket badges or add them on other accessories to personalize your outfits. Another great way to show off your brand or personal expression on clothes or accessories include our Custom Patches which can be ironed or sewn onto fabric garments and accessories..
Q: What material are custom badges made out of? A: Made out of 60-thou styrene, our custom badges for clothing are durable and will stay on strong for all of your business or personal events! We also use high quality inks that are scratch-resistant, so you can show off your brand, ideas, and designs for years to come. Our custom magnetic name badges are great as they use a powerful magnet to attach to your clothes instead of a traditional pin that leave behind holes. We’ve removed the worry factor of ruining your clothes so that you can focus on making your brand or what matters to you stick! Q: What type of finish is available for custom badges? 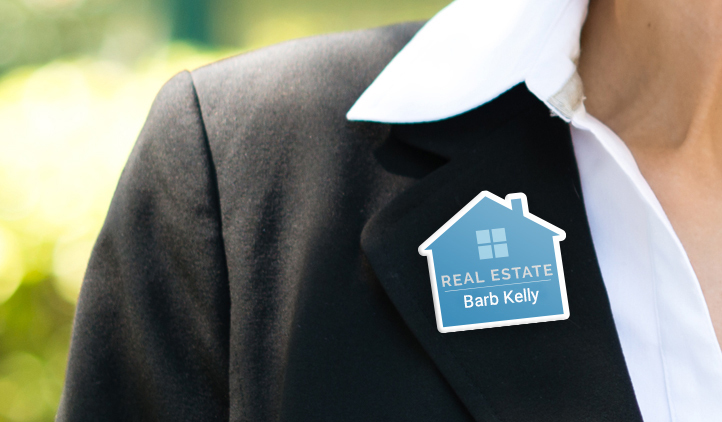 A: Custom badges are available in a matte finish which gives them a beautiful, glare-free look. Matte badges offer a more natural appeal while still looking high-quality, making them perfect for any of your business or personal needs! Q: Will the color of the badge match the color of my design? A: We print out your badges in full color using a CMYK process which lets you accurately achieve your desired brand color. With our custom die-cut badges, there’s no limit in size, shape, quantity or colors so you can be as creative and colorful as you want! Q: Can my badge be die-cut to match the shape of my logo or design? A: Our proprietary die-cutting technology allows your badge to be contour die-cut to the shape of your logo or design! Choose round, rectangular, square or create any shape for your custom die-cut badges to match your brand or design. Q: Can I write on my custom badge? A: Yes, you can further customize your badge and make it truly one-of-a-kind by writing on your own name! 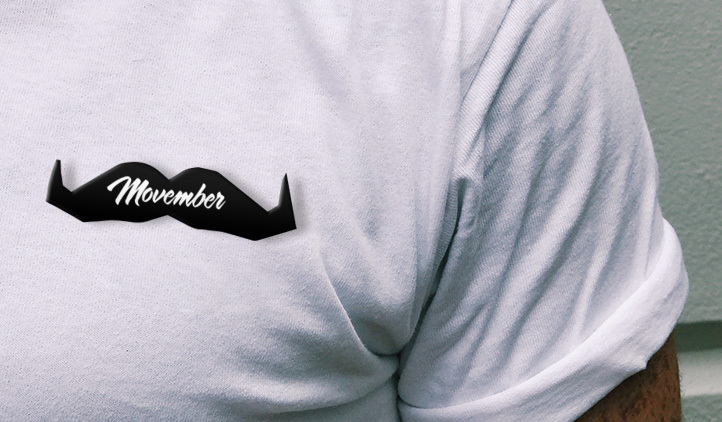 Choose to have your name printed on within your design or write it on yourself with permanent marker. Since name tags are crucial in some business and networking events, our custom writable badges are a great option to make your brand, design, and name stand out. Q: How long will my custom badge last? 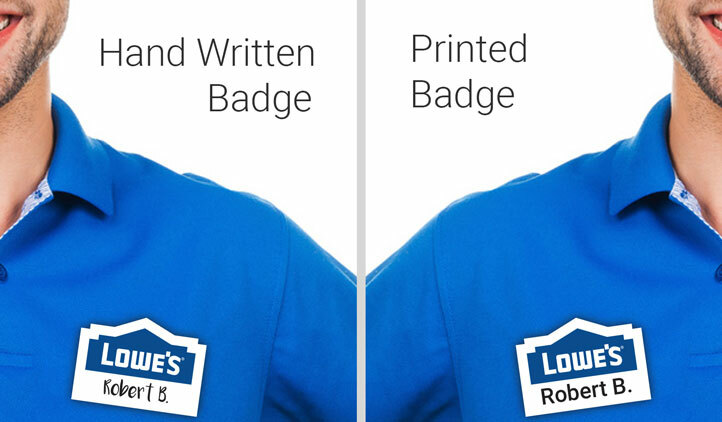 A: Along with being waterproof, weather resistant, and scratch-resistant, our custom name badges will last five or more years! So, you can be sure that your badges will stay on strong and last long. Awesome, sturdy, perfectly printed! I will be getting more. High quality, completely custom badges turned out great. My employees want more, so they can wear their favorite shirts instead of company ones and still represent our brand. Couldn’t be happier with the design I created and the quality of the product! Thanks for your awesome site and fantastic products!